Everyone knows that yoga improves body and mind. But until recently, no one could say certain why,or also how it improves different conditions, like depression, anxiety,diabetes, chronic pain and epilepsy. We knew it worked, but we could not explain how. Now a group of researchers of the Medical School of Boston University think they have discovered the secret of yoga. In a article, published in the May 2012 of the magazine Medical Hypothesis, Chris Streeter, PhD and his team express the theory that yoga works settling the nervous system. And how does it do it? It improves the vagal tone or the body’s capacity to answer to stress with success. (The study: the effects of yoga on the heart independent nervous system, gamma- aminobutyric acid and allostasis in epilepsy, depression and disorder in post traumatic stress). WHAT IS THE VAGAL TONE? The majority of us does not know that we have a “vagus” that needs to be toned up. The vagus nerve, the biggest cranial nerve in the body, start at the base of the cranium and goes through all the body, influencing the breathing system, the digestive system and the nervous system. It is often called our aerial traffic controller. 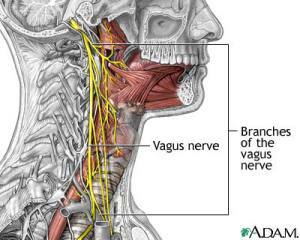 The vagus nerve helps to regulate all our body functions. Our breathing, our cardiac rhythm, digestion and our capacity of taking, processing and giving meanings to our experiences are all connected with the vagus nerve. Vagus nerves and its branches. We know when the vagus nerve is toned up and is working in the right way because our digestion improves, our cardiac functions optimize and our moods stabilize. It results for us easier to pass from an energetic mood with high stress to more relaxed mood. While we working on this, we can manage the life’s challenges with the right mix of energy, relax and agreement. When we are able to keep constantly this flexible state it is said that we have a high vagal tone. On the other way a low vagal tone brings with it a feeling of tiredness , our digestion slows down, our cardiac frequency increases, our mood becomes unpredictable and difficult to manage. It is not strange that a low vagal tone is connected with illness like depression,disorders of post traumatic stress, chronic pain and epilepsy. And it is not a causality that the same illness show a significant improve with the yoga practice. The researchers think that is the stimulation of the vagal tone through the yoga practice that improves these conditions. How does Yoga work? Researches say by affecting positively the vagus nerve. To confirm their theory the researchers studied the practices that in their opinion improve the vagal tone. For example, they find the breathing control techniques, like the Ujjayi pranayama improves the relaxing answer, like the fluidity of the cardiac frequency. A pilot search on yogis with more experience, shows that sing the OM out loud increase the vagal tone more than sing internally to yourself. Research like this starts to show how various yoga practice affects the human physiology in different ways. Once again, Western science meets Eastern wisdom. Translation into English by Tania Alicia Piovan and Noelia Insa. https://insayoga.com/wp-content/uploads/2017/04/logo-insayoga-blog-sobre-yoga-1.png 0 0 Noelia Insa Satorre https://insayoga.com/wp-content/uploads/2017/04/logo-insayoga-blog-sobre-yoga-1.png Noelia Insa Satorre2014-11-15 21:31:042014-11-15 21:50:54HOW DOES YOGA WORK?